Sometimes you’ll want to create a new page on your site but don't want it visible to users yet, or to switch one off so that your visitors won’t see it anymore but retain it for later use. Why is changing a page's visibility state useful? You might want to create a page which you will work on over an extended period until you’ve got it just right, but don’t want it to ‘go live’ yet. You might create a special ‘Holiday Offers’ page which you want to have visible for a short period, but then want to mothball it for later use so you don’t have to create it from scratch again. You might want to have a page on your site that is visible to logged in administratotors (e.g. to share notes), but not to the general public. You might want to have a page which isn't shown on the menu at all, but is still publicly visible, and is linked to from a text link on one of the other site pages (e.g. if your menu is becoming too big and you don't want any more 'top level' pages added to it). Fortunately, Spanglefish offers powerful controls for managing the visibility state of the pages on your site, including Visible, Hidden, Protected and Switched Off. 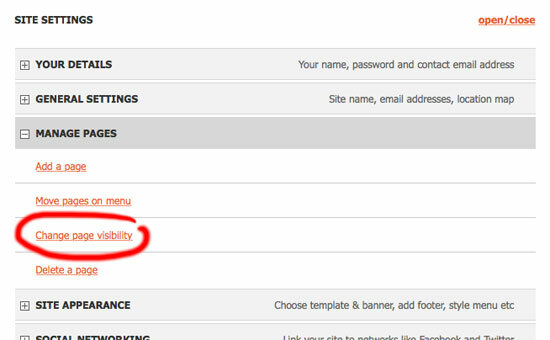 Here is what each state offers . .
To change the visibility of a page, or pages, on your site, go to Site Settings > Manage Pages and click on 'Change page visibility' link. See below . .
Once you have done that, you will see the following control options . .
As you can see, you can see, each page on your site is listed, and each (barring the Home page, which is always Visible, as are any pages 'nested' below it) has a 'radio button' beside its name allowing you to choose the visibility status of that page. Once you have decided what state you want, and have clicked on the relevant radio button for that page, remember to confirm this change by clicking on the Update button at the bottom of the visibility controls panel . . If you have, for instance, changed a page from Visible to Protected, so you can work on it without public visitors seeing it, you will see that its name in the menu is now bracketted, illustrating that it is Protected.